Your time is divvied up between work, school, family, friends, and hobbies, and maybe a yoga class or a quick run in the hours remaining (who needs sleep?). At the end of the day, you find yourself standing in front of a nearly empty refrigerator, wondering how to concoct a meal out of some rapidly browning lettuce and a bottle of Soy Vey teriyaki sauce – or worse, clutching a greasy sack of burgers and fries, bemoaning your lack of planning. Luckily, technology makes it much easier to be healthy, with apps and websites that count your calories, organize your recipes, and even find healthy options at nearby take-out places for those late nights at the office. Now you have no excuses. The first step to improving your diet is figuring out which foods are good for you and which seem healthy but aren’t. Everyone knows that candy and soda can’t be considered healthy in any sense of the word, but some companies call their products “natural” or “heart-healthy,” when they’re really just junk in disguise. A granola bar (packed with whole grains and fiber!) can seem like a quick, healthy snack, but when the first ingredient is high-fructose corn syrup, it’s probably not so nutritious after all. There are a few apps that help you discern which foods are good for you (besides the obvious dark green, leafy vegetables) and which are little more than empty carbs. Fooducate—available for both iOS and Android—has topped many a health blogger’s app list, and for good reason. The app uses a scientific algorithm to grade foods, so when you search for an item or scan the package’s barcode, Fooducate will display a letter grade based on the product’s overall nutrition profile. Searching for an apple turns up various kinds of apples (all graded A, naturally), their calories, and even results for prepackaged apple slices. If you’re looking for a specific type of product—Fage Greek yogurt, say—Fooducate will find the yogurt and compare it to others on the market. Fage, for example, compares favorably with more processed, flavored yogurts, which have more sugar in them. Tech entrepreneur Hemi Weingarten turned Fooducate, which started as a blog, into a free iOS and Android app earlier this year to help fellow parents figure out what food to buy for their families. Now that you know what’s good for you, you'll want to figure out which fruits and vegetables are in season and being grown and sold nearby. Locavore is an iOS and Android app that gives you that information for your neck of the woods, including where you can find the item (grocery store, farmer’s market, and so forth). So the work of sourcing your ingredients and determining how healthy they are is done. Now it’s time to cook. You can find thousands of food blogs and magazines, and many of them are devoted to healthy eating. As with any blogs, these are a matter of personal preference and cooking style. A couple of personal favorites are The Kitchn and Cooking Light, but you may have your own. Or, if you don’t know where to start, click over to a recipe aggregator like Tastespotting and start with what looks good. 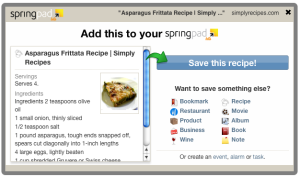 But rather than cut out recipes or write down ingredients, apps like Springpad, Evernote, and MealBoard let you flag the recipes you want to make and organize them by type. MealBoard is the most specific to cooking, letting you enter ingredients and then creating grocery lists. Springpad also has menu-planning tools. With an arsenal of healthy recipes at your fingertips and a shopping list at the ready, eating healthy is now that much easier. Eating healthy can but doesn’t always lead to weight loss. If your end goal is a lower number on the scale or a smaller pant size, there are many apps for that, but LoseIt! is the best by far. This iPhone and Android app was named the U.S. Surgeon General’s top fitness app this year. Mayo Clinic clinical dietitian Katherine Zeratsky says health-related apps and online resources give people the knowledge and skills to build their confidence. If people know what to cook and how to cook it, they rely less on quick fixes like fast food. If all else fails (or you can’t, won’t, or don’t have time to cook), a few resources for healthy take-out or restaurant options include Men’s Health’s Eat This, Not That app (which finds lower calorie options at the big food chains) and Good Food Near You (which finds restaurants with healthier meals in your vicinity). No one wants to give up the occasional take-out burrito, but there are ways to make it healthier.